The both died at area hospitals. 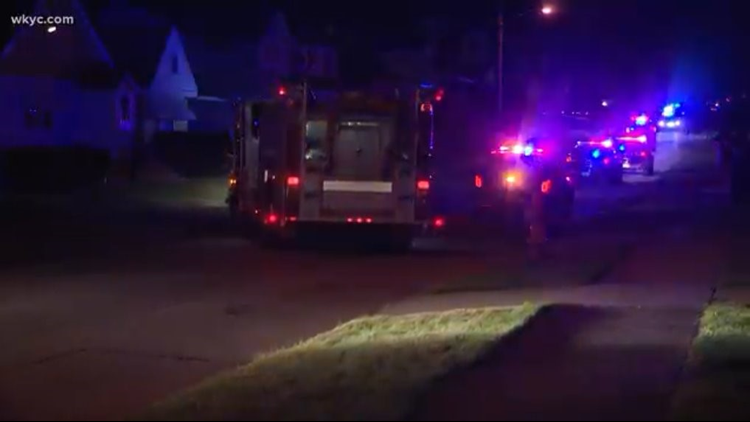 GARFIELD HEIGHTS -- Police have identified the two teens who were shot and killed in Garfield Heights overnight. Police say 17-year-old Manuel Lopez and his 19-year-old sister, Giselle Lopez, were killed in the incident, which happened in the 4800 block of E. 86th Street. Both victims were found laying face down on the driveway when authorities responded to the scene. Officers moved them to protective cover in a neighbor's front yard before both were taken to local hospitals. They both died a short time later. The shooting suspect, identified as 29-year-old Matthew Nicholson, barricaded himself inside the house around 9:30 p.m. and surrendered to authorities after an hours-long standoff wearing a bullet proof vest. Nicholson is charged with two counts of murder in addition to domestic violence. The shooting victims' mother identified Nicholson as her live-in boyfriend. Police also said Nicholson was a private security officer contracted by the Department of Homeland Security. - She said the fight started amid an argument about her ex-boyfriend. - When it turned physical, she told police that her son, Manuel, entered the room and defended her. - Giselle returned home from work as the fight was taking place. - Manuel, Giselle and their mother decided to leave the house when Nicholson threatened to kill them. - As the three were standing in the driveway, Nicholson came outside and fired a pistol, striking Manuel and Giselle. Before he was taken into custody, Nicholson's mother arrived at the scene and told officers she had been on the phone with her son from the time the shooting ended. Authorities directed her to continue communications with Nicholson in an attempt to de-escalate the situation. At one point during the standoff, authorities were told that Nicholson had threatened to shoot any police officer who attempted to enter the home. No shots were fired during the standoff. One handgun was recovered from the scene. Neighbors Vic Sanuk and his wife, Connie Allshouse, say they heard what sounded like loud banging, and then someone knocking on their door. "It was [my neighbor], and she was hysterical, and said her kids got shot," said Sanuk. The woman told them that her boyfriend shot her children. ​​Sanuk says he ran across the street and saw the victims on the ground. They appeared to have been shot, but were conscious. Sanuk and Allshouse called 911. Allshouse said Nicholson often fought with her boyfriend, but police say he did not have a record of domestic violence. "She was afraid of the guy," Allshouse said. "He threatened to kill her numerous times, that he was going to kill her, kill the kids, set the house on fire. This has been going on for four years now. ... I've heard this story from her over and over. And it's finally happened." Shortly after midnight, SWAT officers arrived, followed by a police armored truck. Garfield Heights police contacted WKYC and other media outlets to request that we suspend broadcasting and streaming live images from the scene. WKYC immediately honored that request. Police Chief Robert Byrne says the Garfield Heights School District has made counselors available to students and staff at the high school, where Manuel Lopez was a senior.